If you are interested a purchasing a treadmill for your house or apartment, you are in good company. According to the Sporting Goods Manufacturing Association, treadmill sales exceed a billion dollars annually. Having your very own machine is an important investment in your health, but it will set you back some serious coin. New treadmills generally cost several thousand dollars. But before you decide whether there's room in your wallet for a new treadmill, make sure there's room in your home. Before you ever begin to compare gadgetry and horsepower, you need to determine whether you have enough space to handle a treadmill. While the average size of a treadmill is around 64 inches long and 28 inches wide, dimensions vary significantly, from small portable and foldable models to commercial-sized behemoths standing more than 5-feet high. You need to consider how much room you have to accommodate the length, height and width of a personal model. Taken together, those measurements can help you assess the size of the footprint the equipment will leave in your home. First, you'll need to get the equipment into your home, so keep the size of your home's exterior and interior doors in mind. Units wider than 30 inches make navigating tricky. Manufacturers will often handle your initial assembly and installation, but if you expect to move your unit, you'll want some portability. You also need to allow for space around your treadmill -- at least 2 feet on all sides -- so air can circulate around the motor and you can get on and off the machine easily. The American Council on Exercise suggests allowing for a 30 square foot total area. 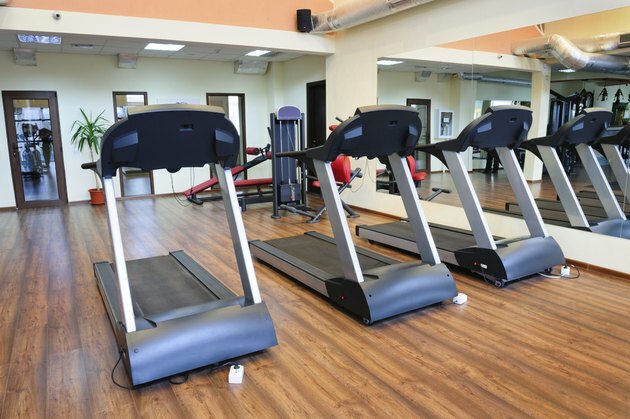 Once you've confirmed you have adequate floor space, you can focus on the size of your running deck -- the actual moving platform component of your treadmill. If you intend to use the machine for walking and you are of average height, your track should be a least 50 inches long by 16 inches wide. If you'll be jogging or running, you will want more room to stride and move your arms, so a track of at least 55 inches long by 20 inches wide is in order. If you have cramped quarters and are willing to make some compromises, consider a compact treadmill. Bear in mind, smaller units have shorter, narrower belts and less powerful motors, which will limit your stride, lateral movement and speed. The American Council on Exercise recommends purchasing treadmills with a minimum continuous horsepower (CPH) of 2.0. CPH refers to how the machine will perform and how much stress and load it can handle under continuous use over time. Many compact units have just 1.50 CPH. If you won't be running or jogging and you weigh less than 180 pounds, these lighter machines may be an option. How Much Height Is Needed for an Elliptical Machine?